Performing truck weighing on site increased productivity for a Victorian grain company. 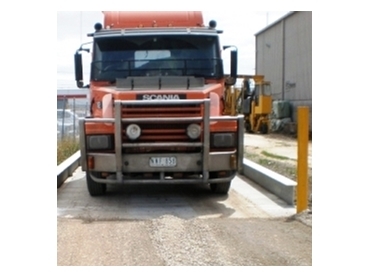 Accuweigh ’s Melbourne branch installed truck scales to permit onsite truck weighing to eliminate the need for trucks to access a public weighbridge. Onsite truck weighing avoids wasted time and effort in requiring trucks to access an external public weighbridge for each vehicle entering or leaving the grain facility. Onsite truck weighing also eliminates the payment of charges levied by the public weighbridges for each vehicle weighing. Due to a favourable land profile, the 28 metre long truck scale was installed at ground level which eliminated additional costs for concrete access ramps. Weighbridge software was also supplied to track details of all trucks entering and leaving the plant and to provide comprehensive management reporting of all vehicles weighed on the truck scales.